This is going to be one food-filled weekend! Then again I must ask myself, what weekend isn’t? Tonight we plan on meeting some friends for Pine State Biscuits on Alberta, then maybe going out on the town for a bit. I also owe Ktams a burger since he found out I binged on a Five Guys burger after my 8 mile run last week (oops. Food is my “other man” I suppose). That means we are off to Little Big Burger (or possibly Killer Burger) for dinner tomorrow night. This Food Lover’s Friday I’m taking you out to dinner—then I’m making you breakfast! Hot, no? I kind of imagine this is what a date and morning after would have looked like if Ktams wasn’t the outstanding cook he truly is! I took the below recipe for some delicious looking hor d’oeuvres and turned it into a meal fit for a weeknight. Yes, it was messy, but it was also delicious! I would highly suggest making my BREAK OUT THE CHIPS Guac (because it’s spicy and delicious)–then using a chipotle or very hot salsa to make the chicken as not a ton of heat really sticks to the chicken. 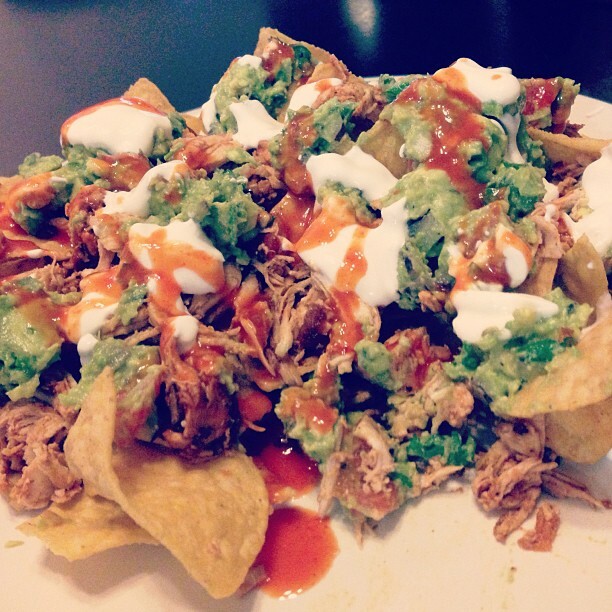 I liked topping our nachos with some hot sauce!! I am a huge protein shake lover! Our favorite protein powder is Jay Robb Egg White, but the whey is great too! I tossed my banana into the freezer before bed last night and surprised Kevin with a peppy shake on his way to work! Although a good base for a breakfast shake there were some changes I wanted to make after making the first batch for Ktams. We used french pressed coffee, and in the future I think I might do our cold coffee recipe to strengthen the taste (which I’ll be sure to share…once it’s a bit warmer). I also halved the amount of almond milk, and ran the drink back and forth between the blender and the glass to try and encourage some air to escape. 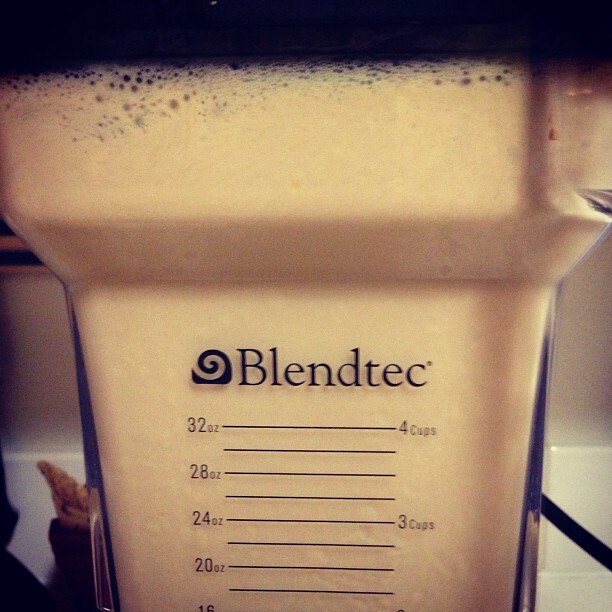 One thing to remember with protein powder is that it fluffs up with blending…a lot. It will literally double the size of your drink, and if your drink is left to sit, foam can end up becoming almost half your glass. If I were to become a coffee smoothie regular, I could also see freezing the strong coffee into cubes (since we don’t have a dispenser) and subbing half my coffee amount with those–as I hate how much ice cubes water things down. I should also mention, before I forget, that I used a liquid vanilla stevia for the sweetener, with which I am quite happy! I’m interested to see how much of a buzz we get off of this shake and if the hunger pangs come on faster because of the caffeine! What’s your favorite burger place of all time? You’re the 3rd person to suggest it! I must now! Oh, so sorry about the piriformis problems! I have had them as well and they are horrible. For me, the only thing that helped them was yoga.